Jacques Boucher de Crèvecœur de Perthes (birth name Jacques Boucher de Perthes) was born in 1788 in the town of Rethel, France. His father, Jules-Armand Boucher de Crèvecœur, was an aristocrat who was a member of the Academy of Sciences in Paris as a result of his botanist background. His mother, Etienne-Jeanne-Marie de Perthes, claimed to be a descendant of Joan of Arc. The prestige that came with his mother’s ancestry was the reason that when Jacques grew older, he changed his last name from de Crèvecœur to de Perthes. As a result of both his aristocratic upbringing and the common belief about the family’s ancestor, Jacques Boucher found himself devoting plenty of time to writing, especially when it came to literature and of politics. Even though he would eventually be known as someone who self-taught many subjects, he grew bored of formal education. Even though the knowledge wasn’t around back then, it is possible that Jacques may have suffered from some form of hyperactive attention deficit disorder, which would explain why he was unable to sit still during schooling as well as his seeming impatience for long sermons as an adult. When Jacques was a teenager, he joined the French customs service, and in a few years’ time he was stationed in Genoa, the capital of the northern Italian kingdoms that France had recently procured. This position was one given to him as recognition of his hard work, and it gave him the ability to help France’s economy, and it also saw him on diplomatic missions on occasion. This lasted for approximately five years, until Jacques was reassigned back to France as a result of Britain attempting to throw out Napoleon. He continued working in customs until the year 1814, when the allied forces overtook Paris, leading to the fall of Napoleon’ empire. After having left customs soon after Napoleon was exiled from France, Jacques dreamed of becoming a well-known poet with several successful poems in place. However, even though he was well versed in literature, there were very few of his poems that had ever received any form of recognition, and next to none of them were performed on stage. Even his attempts to settle down and have a family did not work for him. 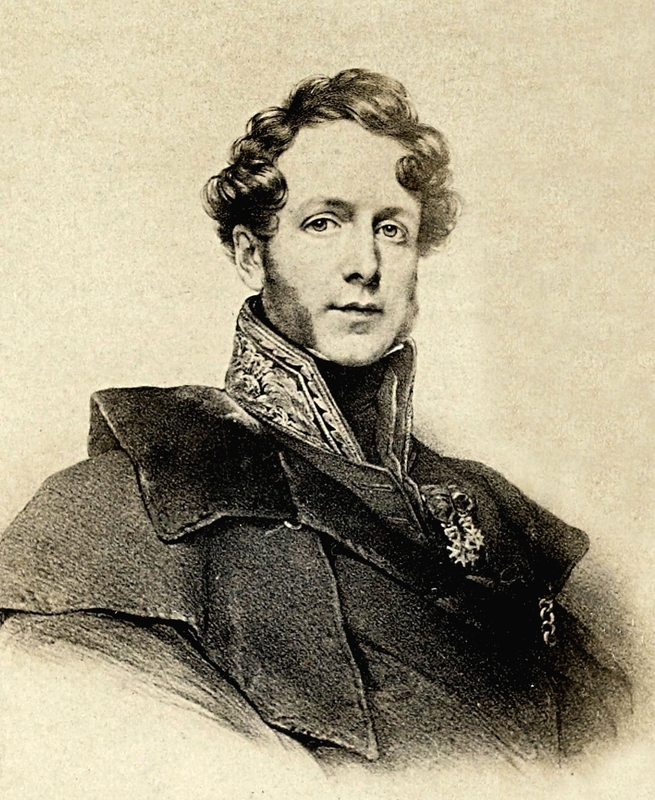 As such, once a new monarchy stepped up to handle France, Jacques once again returned to work in the customs field, where in 1825 he eventually succeeded his father for the position of Director of Customs at Abbeville, his home town. While back home in Abbeville, he spent even more of his time dedicated to writing, as well as sorting out the collection of artifacts and paintings that his father had procured over the course of his life. Dealing with his father’s collection lead Jacques to develop his own sort of personal museum, and he started to take on the antiquarian mindset when dealing with artifacts from the past. As his interest in gathering and maintaining a collection was a casual one, he was less concerned about detailing an accurate representation of history, and he was more interested in the myths and legends that surrounded various lithic monuments, in particular ones that were rather large, with Stonehenge being one of the monuments. Talking to the town’s doctor, Casimir Picard, was part of what spiked Jacques’ curiosity in how and when artifacts, including lithic tools, were created. After the doctor’s death in 1842, Jacques, inspired to do the research that Dr. Picard was never able to do himself, did some excavating of his own accord around the area of Abbeville. Many of the artifacts and remnants that he had uncovered during his early years in archaeology he ended up donating to the Muséum National d’Histoire Naturelle in Paris. The museum was directed by Pierre-Louis Cordier, who was a geologist. It was in fact Cordier who requested that Jacques excavate a quarry just outside of Abbeville to see if he could uncover more artifacts. It was in the Lower Somme River Valley, where the quarry was located, that Jacques would make the biggest find of his life. In this valley, he quickly gathered up quite a collection of flint hand-axes laying besides various bones of fossilized rhinoceroses and elephants which had been extinct from the region for a great while, but that wasn’t the major part of the find; using data that he scrounged up from geologists who had worked in the area before, he was able to date the strata (the layers of rock and sediment) that the tools and fossils were found in. The age of the strata, as Jacques soon discovered, meant that the fossils were from before the diluvial age. The diluvial age referred to the time when supposedly the cataclysmic flood that saw Noah building the ark in the bible occurred. This was a major finding, as Jacques was able to discern that since he had found the hand-axes in the same layers of sediment as the rhino and elephant fossils, that the hand-axes had to be just as old as the remains. This process relied on the geological branch of stratigraphy, which focusses on studying how the sedimentary layers settle in chronological order, with the lower levels of strata typically being older, and the levels of strata that are closer to the surface typically being much more recent. Jacques believed that there was some form of ancient Celtic tribe that was responsible for making the flint hand-axes and other lithic tools that were scattered along the Somme Valley, in particular the Moulin-Quignon site that was in the valley itself. This tribe, Jacques suspected, had to have come from before the diluvial period. This was a highly controversial opinion, since at the time of the discovery, the common belief amongst not only antiquarians but also well-educated scientists was that humans were a relatively newer species, and that there wasn’t a chance that they could have existed at the same time as the fossilized remains of extinct animals such as those Jacques discovered in the Somme Valley. He started writing down his findings in a book he titled De l’industrie primitive. In this book Jacques described through writings and illustrations everything he had been working on in the past decade of excavation and research, and he primarily focused on the flint hand-axes that he had discovered in the Somme Valley. He took the opportunity to discuss the antiquity of the human race, and in particular, he described how his research and the findings within the valley prove that humans were far older than what was initially believed. After having finished it in 1846, he sent a copy to the Académie des Sciences in the hopes that they would mark up a good review and thus his work would gain a sort of following. Unfortunately, the Académie chose instead to ignore the book entirely. After receiving word from Cordier, who was one of the members of the Académie that turned down the book, that the Académie would not accept the research, Jacques decided to officially publish his findings in 1849 under a new name: Les Antiquités Celtiques et Antédiluviennes, which translates to Celtic and Diluvian Antiquities. However, his findings went against the religious views of the time, so his work was not well received. It wouldn’t be until the late 1850’s that scientists would start realizing that Jacques’ belief, that humans were much older than previously thought, was actually correct. Even though it would take some time for Jacques’ research to begin to take hold, it would become a key part of a major turning point in archaeological thinking. The Les Antiquités Celtiques et Antédiluviennes eventually was used to prove that humanity was much older than what was initially believed by both religious and scientific individuals. This finding, while not nearly as well-known as those of the late Charles Darwin, proved to be just as instrumental in altering the beliefs of society at the time it was published. The work that Jacques did was important enough, in fact, that he eventually received in 1864 the medal of Officier de la Légion d' Honneur by Napoleon the second for the major impact that his work had on the scientific community. The biggest opposition against Jacques’ claim of the older humans was the idea that the world had only been around since 4004 B.C. The Archbishop James Ussher (1581-1686) had paved the way for this idea that the Earth was a much younger planet than what it actually is. 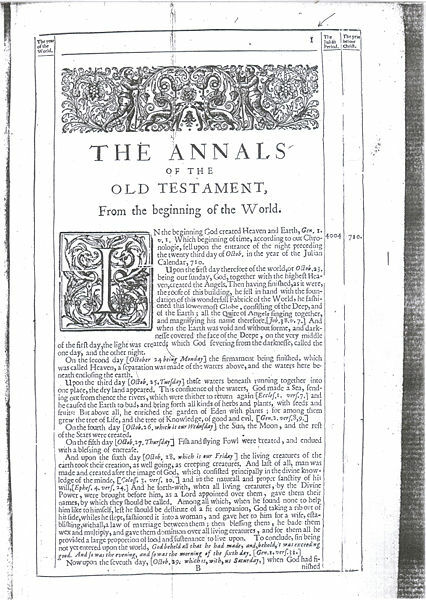 His book, Annals of the Old Testament, declared that the Earth was created on the 23rd of October, 4004 B.C. Even though Archbishop Ussher wasn’t alive at the time of Jacques’ discovery, there were still many key figures in the science community who held onto the belief set by the Archbishop, and those members would instantly disapprove of anything that dared question the supposed Earth creation date. Since Jacques’ discovery proved that not only were humans around long before the apparent biblical flood, but that they would have been around much longer than the 6,000-year limit that the Archbishop set, his work tended to get ignored or mocked for some time. As time progressed, his books became more and more acknowledged. While he was starting to finally get the credit he deserved for his big discovery, it wouldn’t be until 1859, when Charles Darwin published his On the Origins of Species which determined that species evolve over time with their environment, that Jacques and his research would receive recognition for actually proving true. As a result of Jacques’ work finally getting a solid hold on the world, the archaeological and scientific communities slowly started to distance themselves from the idea that the world was created in the year 4004 B.C., and as such, archaeologists in particular started to excavate deeper to try and determine just how long have humans been around, and how exactly did these ancient humans survive and thrive. As well as the major change that Jacques’ work would have on altering the belief that Earth was relatively young, his research also greatly influenced many archaeologists, both from around his time to even some more recent ones. 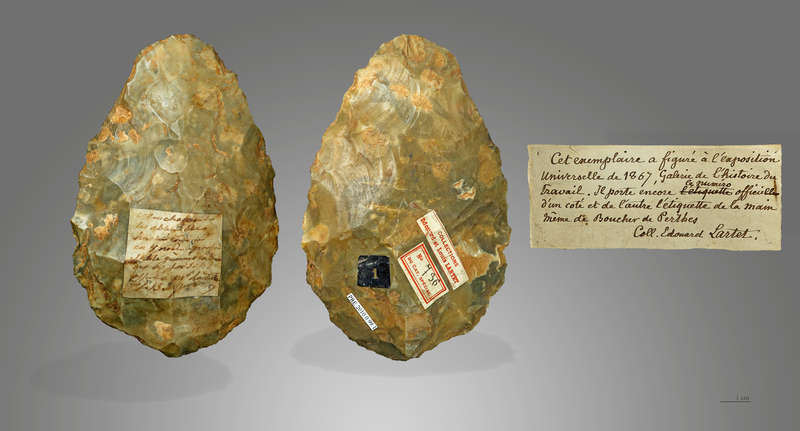 Even the person who would eventually become somewhat of a rival to Jacques, Marcel-Jérôme Rigollot, was directly influenced by the hand-axes that Jacques had dug up within the Somme Valley, as well as the possible implications that those lithic tools meant in terms of the age of humans. Rigollot published a book just a few months before he passed away that outlined his own dealings with hand-axes within the same valley that Jacques had dug up. Unfortunately for Jacques, Rigollot’s work was much more widely accepted, since he cared less about the ramifications of such lithic tools being found in close proximity to long extinct rhinoceros and elephant fossils, and more on just describing what he had found. On the other side of this, as a result of Jacques pushing against the scientific status quo of the time, his work resulted in a much bigger wave of change, which meant that him and his book would become far more recognized than the book that Rigollot had published. Unbeknownst to Jacques, his work would have a massive impact on not only how archaeologists perceived ancient humans, but also on how society in general would think of humanity’s past. He paved the way for a multitude of scientific discoveries concerning the history of the species in a major way. Before his research, there weren’t that many scientists who would dare question the age that Archbishop Ussher had set for the Earth. It is a result of Jacques’ discovery in the Somme Valley that people started to dig deeper and uncover some of the ancient ancestors to humans, such as Neanderthals and Denisovans. His methods as well would be used even into the present day; methods including using the strata to determine the approximate age of an artifact as well as associating animal and human remains to the various tools that were discovered. Boldair. 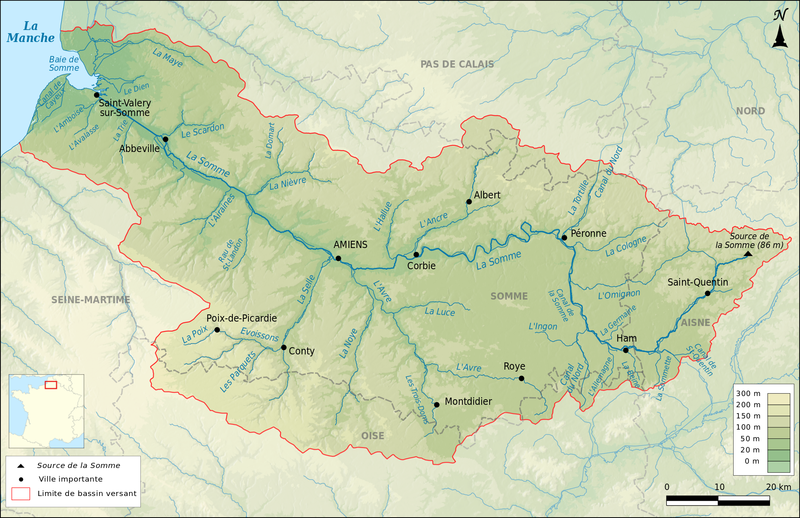 "Français : Carte Du Bassin Versant De La Somme." File:Bassin De La Somme.svg. Wikimedia, 1 Jan. 2016. Web. 14 Apr. 2016. Bonanno, James P. Encyclopedia of Time: Science, Philosophy, Theology, & Culture. Ed. H.
James. Birx. Los Angeles: Sage, 2009. SAGE Reference. Web. 9 Apr. 2016. Volume 157 1895: 939-46. Blackwood's Magazine - Google Books. Google Books. Web. 9 Apr. 2016. Perthes MHNT.jpg. Wikimedia, 3 Dec. 2011. Web. 14 Apr. 2016. Dowson, Thomas. "Going Back to the Stone Age - Archaeology Travel." Archaeology Travel. Performance Foundary, 15 Nov. 2011. Web. 09 Apr. 2016. Perthes.jpg Wikimedia. Wikimedia, 17 Jan. 2013. Web. 5 Apr. 2016. Feb. 2008. Web. 14 Apr. 2016. Martin, Paul S., and Richard G. Klein. Quaternary Extinctions: A Prehistoric Revolution. Books. Google Books. Web. 9 Apr. 2016. 1849)." HistoryofInformation.com. Jeremy Norman & Co., Inc. Web. 09 Apr. 2016.
of Human Antiquity. 6 Jan. 2014. Web. 9 Apr. 2016. "Abbeville Stone Tools." World Archaeology. World Archaeology, 02 May 2011. Web. 09 Apr. Wellcome Images. "Diagrams Showing the Characteristics of Antediluvian Flints." 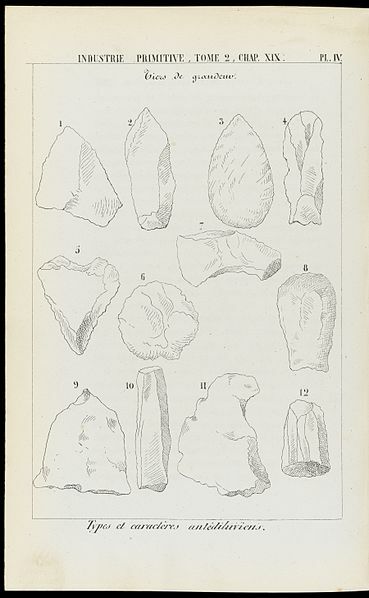 File:Diagrams Showing the Characteristics of Antediluvian Flints Wellcome L0072211.jpg. Wikimedia, 20 Oct. 2014. Web. 14 Apr. 2016.